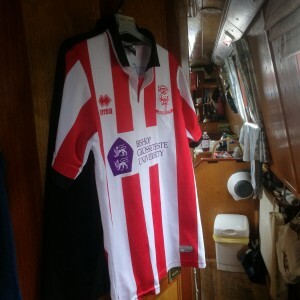 Narrowboating Chick | Tackling the Tidal Trent- Again! Tackling the Tidal Trent- Again! Turning into the incoming tide from Torksey. All geared up for our trip, 6am came around surprisingly quickly. Aware that James and I would be spending at least 5/6 hrs inside the boat with no way to step off, we snuggled in bed for a little longer and let Marcus, at 6.30am sharp, carry on with getting Harebell down to Keadby. We could see the flow of the flood tide across the entrance to the side arm where we were moored and compared to our last trip down with the Spring Tide, it looked quite gentle. 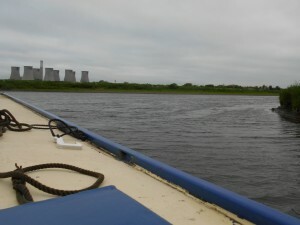 Nevertheless, it was with some trepidation that we turned onto the Trent proper. The incoming flow was indeed gentle, as although we were pushing against it, it did not impede our progress. In fact at 7.40 we were 9km down river at Knaith Hall. A quick phone call to our favourite lockie to ask a for more information about slack water (there is some, but not for long! )and we estimated that we should be on high water by now. Sure enough, by the time we reached Gainsborough, 8kms and 1hr later, it was most definitely an ebb tide and had it not been for the northerly wind, we’d have made better progress. However, the rate we were cruising was none too shabby and we sailed past West Stockwith at 9.30. This was when the trepidation really started, along with that dreaded wind, which whipped up the waves again and sent Harebell up & down, her prop spinning in the air as her back end came out of the water as she rode the waves and she confidently broke the waves with her bow. Choppy waters past West Stockwith. 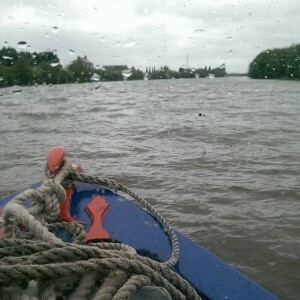 Needless to say that the weather got worse as we headed to Keadby, but we still made good progress with the ebb tide. 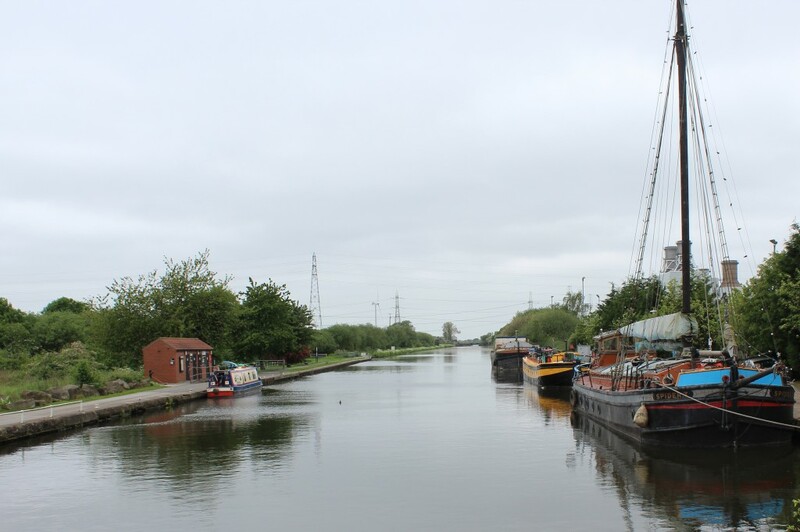 Knowing that we were crusing on a neap tide meant that we knew that there would be no issues getting into the lock at Keadby- neap tides do not rise or fall as far as other tides, meaning that there would be plenty of water and no danger of getting stranded. By 11.30 am we were passing under the M180 bridge and I made the requested call to the lockies at Keadby to tell them that we were nearly there. The last half hour passed quite uneventfully and then suddenly the lock was upon us- Not quite as tricky as getting into Stockwith but still a manoeuvre past the lock and against the flow. Within moments, we were in the calmer waters of the lock and beginning the steady climb to the top and onto the Stainforth & Keadby Canal. A handy facilities station just outside the lock and past the first (of many!!) 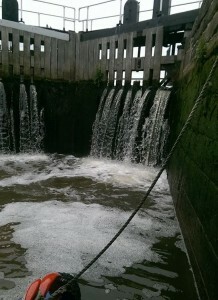 swing bridges was an ideal place to catch our breath and fill with water etc. I was able to put the plants back on the roof and generally get back to “normal” and be on a canal again. Very different from the rivers we’d so quickly got used to, the pace was a lot more serene and the views a lot broader. We operated a few swing bridges and cruised steadily, but by about 4.00 ish, enough was enough and we decided to moor up and let the day end in in lovely chill out. We were moored by a railway line that ferried biomas to Drax Power Station and James had a great time watching the trains passing. The fire had to be lit again as there was a definite chill in the air and we were all ready for bed quite early- tomorrow’s another day. The start of the Stainforth & Keadby Canal.